I am a professor in the Department of Prehistory, Ancient History and Archaeology at the Faculty of Geography and History at the University of Barcelona. Director and founder of CEIPAC (Center for the Study of Provincial Interdependence in Classical Antiquity) and Director, founder and Principal Investigator of EPNET Project (Production and Distribution of Food During the Roman Empire: Economic and Political Dynamics). José Remesal Rodríguez (Lora del Río, Sevilla, 06-27-1948). 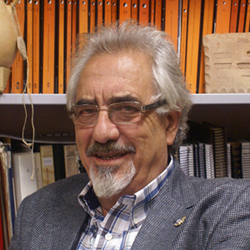 Professor of Ancient History at the University of Barcelona since 1988. Grant holder at the Instituto Rodrigo Caro (Madrid) (1973-75) and at the Escuela Española de Historia y Arqueología (Rome) of the C.S.I.C (1976). Grant holder at the C.N.R.C. (Rome) (1977). Membre libre at the Casa de Velázquez (Madrid). Mitglied der Alexander v. Humboldt-Stiftung (Heidelberg). Korrespondent des Deutsches Archäologisches Institut (Berlin). Académico de número de la Real Academia de la Historia (Madrid) and Correspondiente de la Real Academia Sevillana de Buenas Letras. Socio Corrispondente del Istituto di Studi Romani. Member of the Bureau of the Union Académique Internationale and Delegate of Spain for this institution. Founder of the Centro para el Estudio de la Interdependencia Provincial en la Antigüedad Clásica (CEIPAC), with projects in Austria, Germany, Italy, Libya and Tunisia. Founder of the series Instrumenta. His works have been published in many countries and languages. Research interests The main subject of his research is the study of the interaction between political and economical life in the Roman world, based on the study of the production distribution and consumation of food. He specializes in amphorae epigraphy. Another of his research lines is the studies of historiographic nature. His works have been published in 14 countries and several languages.